I’m not 100% sold. She’s coming from a 2010 Equinox (2.4) that she likes a lot but feels is too “loud and rough” for her new sales job which requires more time in the car driving. Better economy would be nice too. Made her check out all the competition over the last 2 weeks. 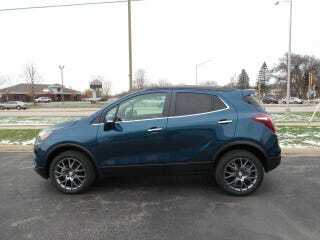 Mazda CX3/CX5, CRV/HRV, Rogue/Juke Terrain, Trax, Santa Fe/Tuscon/Sportage. Even some bigger sedans like the Lacrosse, 300, Accord. She liked the Buick! The Encore is surprisingly quiet on the inside and very smooth (soft) over bumps. She, unlike us Oppos, is looking for basically a sensory deprivation chamber on wheels. She’s not a fan of most leathers so prefers a more premium feeling cloth seat. Interior on the Encore is somewhat tight compared to the others, but she never really uses all the space in her current ‘Nox so smaller should work for her. She likes Deep Azure Metallic, and I’m pushing for the Sport Touring trim for these wheels and slightly higher HP, 1.4 Turbo engine. Lots of deals out there. Anybody know about the engine in these? I have a Sonic with GM’s 1.4T, but this one has an optional 1.4 SIDI engine with more power and start/stop tech. The power/torque increase is tempting, but I don’t like that start/stop stuff. Should I go for the newer 1.4 with more power or the older 1.4 from the Cruze/Sonic? So, I know it’s out of your comfort zone Opponauts, but any thoughts? I’m open to all feedback. The car is for a non-Oppo, so i wont be offended, haha! I like the CX-3 the most, but my wife felt it was too stiff and low for what she wants. It was, but that was exactly why I liked it the most. The CX5 was my runner up, but the interior gets pretty cheap if you want cloth and don’t get the higher trim levels.